Aside from a few Rodgers & Hart standards, what else does anyone know about this show other than that joke? It was Jimmy Durante, dwarfed by the pachyderm behind him, who made famous that deadpan crack in the old Hippodrome when the musical first premiered in 1935. It was producer Billy Rose's attempt to revive the decaying stadium-sized theater on 6th Ave. with a spectacle of such scope it makes today's technological marvels, Spider Man or The Lion King, pale in comparison. 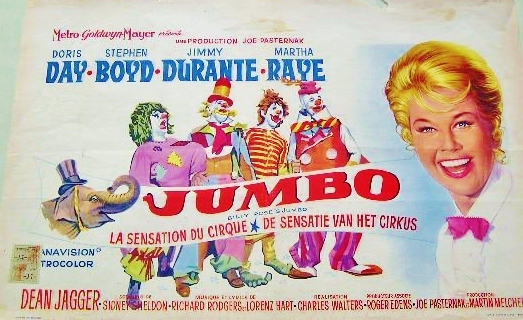 Jumbo had thirty-one circus acts, 32 singers, 21 principals, 16 dancers, 17 aerialists and 500 animals, plus a "book" show (by Front Page authors, Charles MacArthur & Ben Hecht, no less) with songs by Rodgers & Hart--this all in the depths of the Depression when $100 bought a hundred performers. Despite the hoopla, or maybe because of it, the show closed after only five months, and the 5,000+ seat arena went into steep decline and was demolished within four years. Arthur Freed's unit at MGM was first set to make a movie in 1947, with Charles Walters directing, then in 1952--with Stanley Donen, upon finishing Singin' in the Rain. ('52 was also the year of Cecil DeMille's circus epic, The Greatest Show on Earth--possibly the least deserving Oscar winning Best Picture.) Unresolved script problems postponed the project for a decade, by which time Freed and all MGM's producers had their units cut--and now worked on each project independently. 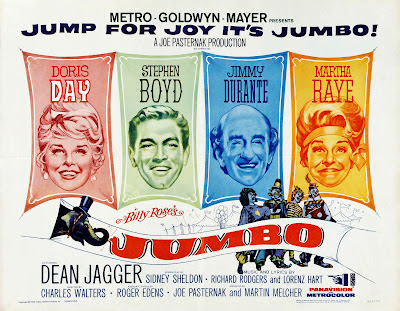 Under Joe Pasternak's supervision, with Charles Walters' direction, Jumbo finally came to light in 1962: the year of Richard Rodgers' post-Hammerstein resurgence. Not content with a new Bway show and two R&H movies in release, it was also time to redraw water from the R&Hart well. And as MGM already owned Jumbo (for a fancy price), why not? 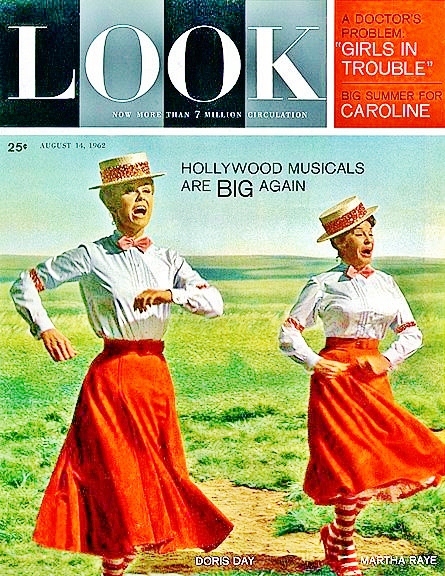 The revived project seemed to be geared from the start for Doris Day. Her first musical after her contract with Warners expired was for MGM: Love Me or Leave Me--a triumph for all concerned, especially Day who wowed Hlwd with her acting chops as well. Six years later she was the #1 box office star in America, commanding a salary of $250,000; and riding a second wave of tidal proportions in contemporary comedies, having all but abandoned musicals. Her last was Pajama Game, which while arguably her best ever, was not a happy experience for the star, stepping into a long integrated Bway company as an interloper; nor was it a major hit. She might well have been Nellie Forbush in South Pacific, were it not for her abrasive manager/ husband (some attribute her losing the role by refusing to sing at a party for Josh Logan--despite her history as a band singer she was by then terrified of singing in public.) She barely sang in movies now, but for the occasional tune over the credits. But the combination of Doris Day, a Rodgers & Hart score and a circus setting for the whole family loomed as a goldmine prospect. Enuf to convince MGM to spend $5 million, making it the most expensive musical in the studio's history up to 1962. You'd never guess it from the look of it. 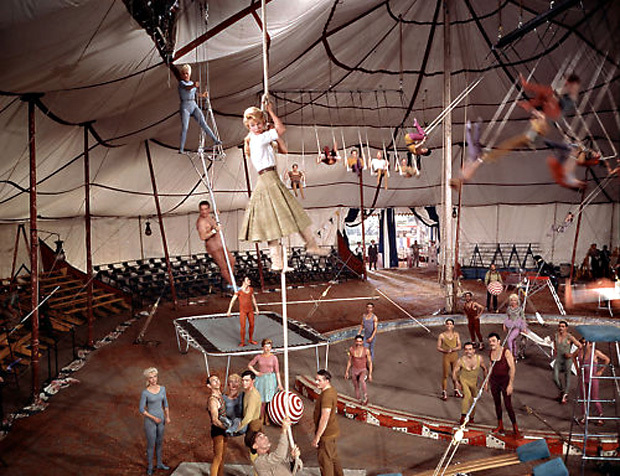 Logistically, yes, there's a lot of background circus activity, but little of it looks expensive or pleases the eye--much of the film looks rather shabby. Even Doris is cheapened by an unflattering strawberry wig that attempts a Jackie Kennedy re-do of a Lillian Russell style. Where the Bway show was contemporary (1935) the film's story is steadfastly a period piece--set in some vague once-upon-a-time past that Annie Get Your Gun also inhabits. Doris plays Kitty Wonder, or as she's billed in the circus, "Princess Kathryn" whose specialty is executing ballet moves while shuttling between the back of a white horse and a trapeze. Complete with pink tutu, faerie wings and sash, it's an act only pre-adolescent girls could love--and a snooze to the rest of us. ; not least because it's mostly performed by a stunt double. 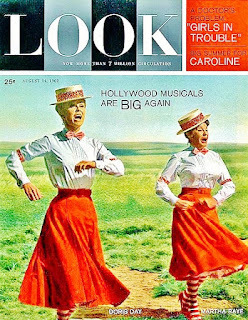 Is a closeup of Doris Day! Ninety minutes of Doris Day! There was nothing to do but pray. And how do we go? We fly. Why? What Do We Do? We Fly"
Billy Rose had written into his contract that should there ever be a film version his name would be part of the title. And so it was not Rodgers & Hart's but Billy Rose's Jumbo. There wasn't any stipulation to keep Durante, but he was back to play ringmaster nearly 30 years later. After starring in 35 low-budget movies in the '30s & '40s (some with Buster Keaton--a partnership MGM wished to make into a famous film team, without success), Durante hadn't made a film since 1950, moving into television, whose early years were a goldmine as much as a refuge for all aging vaudevillians. So it's rather astounding to see the 68 year-old playing one of a quartet of stars in 1962. He made his final movie a year later, playing but a bit part: the dying Smiler Grogan, whose final words ignite the chase that propels It's a Mad, Mad, Mad, Mad, World. As Durante's long-suffering fiancee, Martha Raye was no spring chicken either, but she was still a good 22 years younger than her screen partner. Thru-out my childhood I never quite understood who she was or why she was famous (or for what --aside from her alarmingly large mouth). Coincidentally, both Raye and Durante had their own TV programs on NBC between 1954-56. Composer Hugh Martin, who worked closely with Judy Garland, among many other vocalists, cites Raye as his all-time favorite singer, which I imagine would bring anyone sane to ask, Really? Not that I have anything against the old broad--er, lady. But, really! Richard Burton was first sought for the film's romantic lead. It's hard to imagine him taking a part like this, or why he (or Stephen Boyd who got the role) were wanted over someone like Gordon MacRae or Gene Kelly--who had more resonance and experience in tuners. Boyd, tho handsome, was a rather stiff actor whose big break was playing Charleton Heston's chariot-racing nemesis in Ben-Hur. He has little chemisrty with Day; his singing voice is dubbed (by some upstart named James Joyce!) and his tightrope feats are executed by stuntmen. Aside from that he's perfect for this musical. The titular pachyderm, who aside from some concocted winks displays no real personality, is put thru his paces performing various stunts without the slightest sense of joy or spontaneity. It's rather sad. And for a title character his presence is rather lacking. Not like that other circus elephant, Disney's Dumbo, who (albeit animated) truly headlines a briefer, more enjoyable musical altogether. The original Jumbo was an elephant sent from the French Sudan in 1861 to a zoo in Paris, and four years later to London--where he was ultimately named (from the Swahili word for "hello": jambo). His fame and popularity were such that his moniker permanently entered the language as a description of size. PT Barnum purchased the elephant in 1881 and brought him to Madison Square Garden, and later on tour where he died when struck by a train in Ontario, Canada in 1885. Neither the Bway show, nor the film made any allusions to the historic creature aside from appropriating his name. I was never fond of the circus, and as I've never known anyone who was, I think the only people who love it end up joining it. The Big Top was animals, acrobats and clowns--all of which I found either creepy or boring. Of course since the 1980s the institution has been so completely reinvented by Cirque de Soleil that it's unrecognizable from its 19th century origins--and a good deal more enjoyable. But the horse-and-buggy-days outfit here is a tired affair. The colorful canvas posters that fly up on poles in the opening raising-of-the-tents number, promise us the Dog-faced Woman, the Fat Lady, the Siamese Twins; the familiar catalog of freaks; but Jumbo steers clear of anything so exotic. The cast here is so generic as to make the citizens of River City in Music Man look like a Fellini carnival. (And what an opportunity lost to not have used some freaks in a musical number built around "The Most Beautiful Girl in the World.") What's left are some hoary specialties like Durante's clown bit, Jumbo's dance, a high-wire act, ballerinas on prancing horses, a Mother Goose parade--all of them so goody-two-shoes and old-fashioned as to be soporific. Sidney Sheldon's screenplay is barely serviceable, which makes you wonder how bad it previously was if it took a decade to get up to this level. Like every circus story, the big tent is on verge of folding--so the circus must be saved! But why? Not every circus--certainly not this one. And, as always, the villian is a competiting circus (supporting my contention that only circus people are interested in circuses); which sets up the "Romeo & Juliet" romance; here the single conflict in an otherwise lazy love story. There's the obligatory storm scene, the tents ripping over the terrified crowds; a horrible reminder of a very real circus tragedy: Barnum & Bailey's great fire in Hartford in July '44, which killed 168 people, and banned circuses from the state of Connecticut for more than half a century. Jumbo's storm merely strands Doris up on the trapeze, necessitating a rescue by Boyd. After that, screenwriter Sheldon has nowhere to go but to let them actually lose the circus. And here's where it gets looney. The remaining trio, Day, Durante and Raye form a band of merry players; and "rebuild" their Wonder Circus, playacting tacky scenes from their painted wagon. It's pathetic and thoroughly unconvincing. 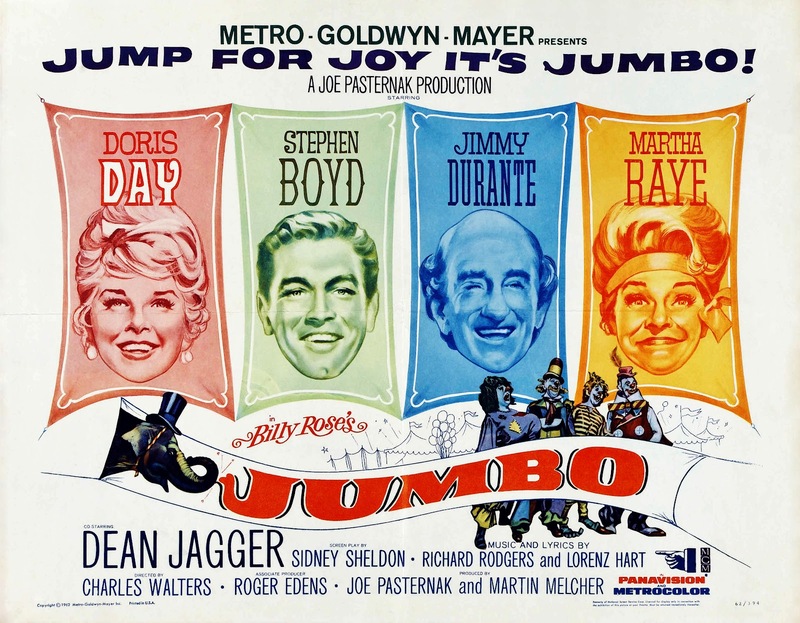 After enuf of this, our hero, Boyd, having spurned his father (a moustache-twirling Dean Jagger--the other circus owner), returns with Jumbo in tow (hidden, mind you, in a haystack awaiting his musical cue). For it's not enuf for the lovers to reconcile, first Boyd must posit the query, in a minute-and-a-half verse, "What is a Circus?" before getting to the refrain, "Sawdust, Spangels and Dreams"--a song not by R&Hart but Roger Edens---as usual suffering the comparison. The song is meant to be a rallying cry, but instead of showing us the ultimate fate of these folk, the number becomes pure illusion--moving onto a set that looks more like Follies' "Loveland," or the circus dream from Lady in the Dark. The sequence devolves into absurdity (Durante catching Raye on the trapeze? ), and worse: clowning--entire skits in full clown regalia that fail to generate a chuckle. In conclusion, the clown faces drop below frame, and return for the fade-out cleaned-up and in wedding finery--thus sealing all the worst cliches of Day's image in one overblown, failed epic. Tellingly, the film was an enormous financial disappointment: $2,750,00 in rentals--the lowest of any Bway musical in years. Still, riding off two mammoth comedy hits, Day was the #1 box office star of the year--and the next two; and in the top ten for two years after that. But within two years more she was not only passe, but virtually irrelevant. Instead of adapting to the changing times, (she famously declined Mike Nichols' offer to play Mrs. Robinson in The Graduate--which seemed a natural progression from her sharper modern comedies) she was steered into maintaining an "image" that even she had long ago outgrown. In 1968, like Garbo, she retired forever from the silver screen. By then her vogue as a vocalist was even more out of fashion. But a five-year sitcom and her 38 films in constant circulation on TV would keep her popularity afloat. Columbia Records promoted the soundtrack, with fair success. Only five Rodgers & Hart songs from the original production are used. But what five! In truth the Bway production only required half a score as it was. And of those, they cut just a couple of specialty bits for Durante and some filler; which virtually requires interpolating other R&Hart songs to fill out the evening. But of all songs to choose from their catalog, the obscure "Why Can't I?" for a duet between Doris & Martha, is an unexpected curiosity. On the other hand, "This Can't Be Love" was a known popular song, but seems a senseless choice for Doris's Princess-on-horseback routine. The Bway show announced R&Hart's retreat from several unhappy years in Hlwd; a pitch-perfect wind-up to their upcoming run of Bway hits, all with consistently lovely compositions: On Your Toes, Babes in Arms, The Boys from Syracuse, Pal Joey to name but a few. Jumbo introduced two waltzes, two ballads, and a march--and even cast one song aside for On Your Toes, another classic, "There's a Small Hotel." "My Romance" is one of those gems that astonishes with the purity and simplicity of its melodic line. But I count "Little Girl Blue" (along with "My Funny Valentine" and "Glad to Be Unhappy") among those R&Hart songs I find overrated. Doris is featured on both, and pure as her voice is, the tempos are so slow (as she favored more and more) as to render her the distaff equivalent of Perry Como. Zzzzz. At least there's some context for the ballads in the story; I'm more hard pressed to understand what is going on in the lead up to and during "The Most Beautiful Girl in the World," a lame flirtation dance using a carousel for a prop, and ending with Doris face down in the mud. The song is one of Rodgers' great waltzes, and thankfully gets much more play as underscoring thruout the movie. An equally tuneful, but little-known waltz is "Over and Over Again," which is used for what I'd like to say is the stunning rehearsal number for the acrobats. But closer examination reveals the number itself is less stunning than the music. It was staged by the legendary Busby Berkeley, who at 65 would find this his last work on film. The movie's best, most coherent number is the "Circus on Parade," introducing us to the catalog of attractions (most of which we never see again): Durante, Raye; a disturbing clown-faced "Cleopatra," and Dodo bringing up the rear riding a team of white horses, all bearing plumes. It almost makes you want to go see the circus. Almost. Another Dodo, my favorite surrogate mother, whose sweetness, humor, and good nature--just two houses down --was every bit a match for Miss Day; took me and her son, Stevie, to this circus around Christmas time in '62. (The movie premiered at Radio City on December 6th) I had just turned ten and was still reeling from the mental Disneyland that was The Music Man so I wasn't much impressed with Jumbo. Far more exciting was the treat of a restaurant dinner (my parents were not advocates of dining out when good boiled beef could be made at home.) Dodo introduced me to both Bob's Big Boy (where I discovered roquefort dressing) and better still, the International House of Pancakes: where I'd feast on their "international" hamburgers as if I were dining at Chasens. Since then, every IHOP I see reminds me of both my Dodos. . . and Jumbo. the Musical has been my lifelong touchstone. How did this happen? What does it mean? Herewith an analysis of my own"glass menagerie;" a Proustian trail of memory and perhaps a final summation of my thoughts and feelings on this unrelenting vocation. A man on the verge of a musical breakdown. Why did I do it? What did it get me? Scrapbooks full of me in the background: New York, Hollywood, San Francisco. Palm Springs. This time, boys, I'm takin' the bows.